Tornado Alley maps don’t all look the same, why is that? The information here is only one opinion and not the only thoughts on where tornado alley lies. 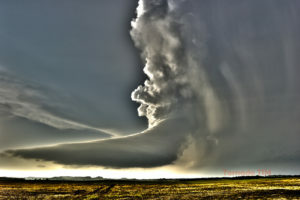 Here is what Tornado Tim Baker thinks and what he has found in his research. 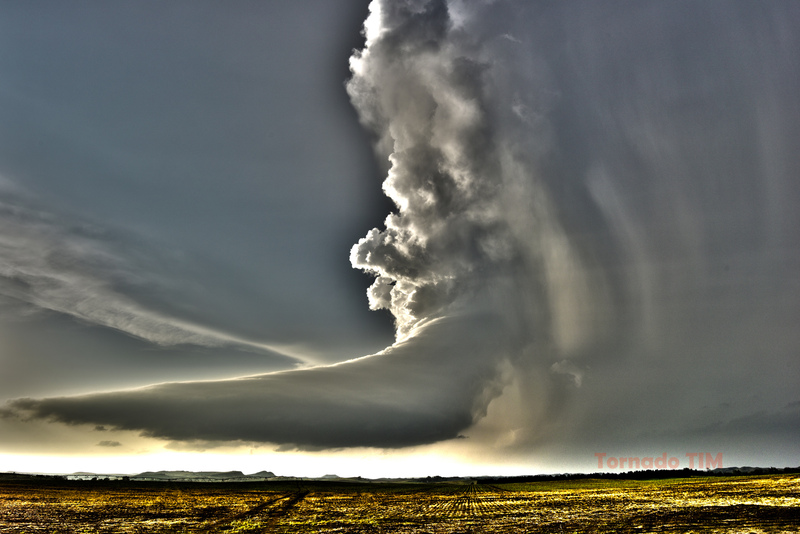 Are traditional tornado alley maps wrong? Tornado alley maps are sometimes based on the area where only the most intense killer tornadoes are likely to occur, looking where F4 and F5 tornadoes have struck in history multiple times. Other draw tornado alley maps where tornado frequency is the highest, looking at areas that have recorded multiple tornado touchdowns consistently year after year. When looking at tornadoes for a given year, one might suggest certain states get enough tornadoes to qualify as part of tornado alley. But when looking at tornadoes over many years it becomes clear that those were just unusual years for them. And now, with many areas experiencing warmer than normal temperatures, traditional tornado alley maps don’t seem to represent those climate changes accurately. I believe we need to rethink where tornado alley is with these climate changes. A warm January will lead to a shift in tornadoes to more north and eastern states than traditional tornado alley maps represent. But we are taking a smaller sample of data to arrive at that conclusion. 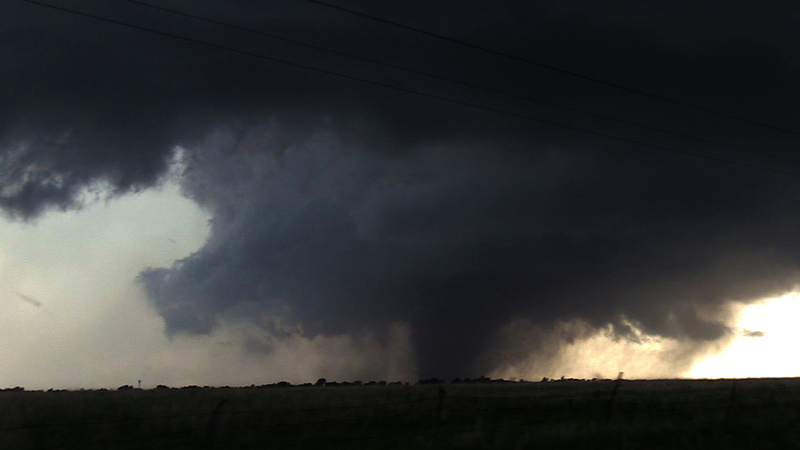 Arguments over what states are in tornado alley is a valid discussion, but what we need to do to be fair is qualify what criteria you are using in determining tornado alley. In 2004 people in Illinois were at greater risk than most of the areas people think of as tornado alley. But that was an unusual year for them. If you were to be exact about tornado alley, it would really be made up of hundreds of little strips, and never one large alley. Tornado alley maps are all made up of a general area from data taken over a long period of time. Tornado alley should be thought of on a more yearly basis also, since weather patterns can change, making some states harder hit one year versus others, like Illinois in 1925, 1974 and 2004. 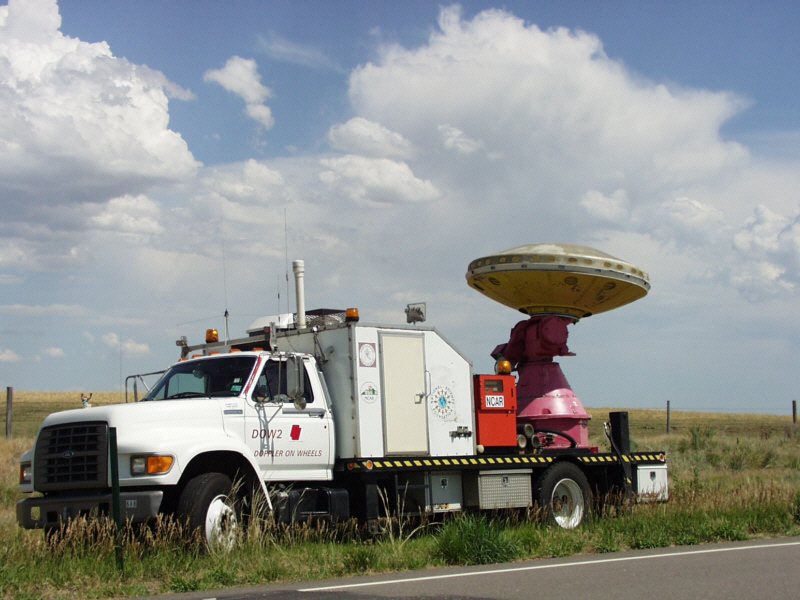 Some people have asked if tornadoes appear everywhere in tornado alley. The fact is on all tornado alley maps there are areas that have never had a tornado hit there. Remember, not every city in tornado alley has been struck by a tornado while others have had many tornadoes hit them. 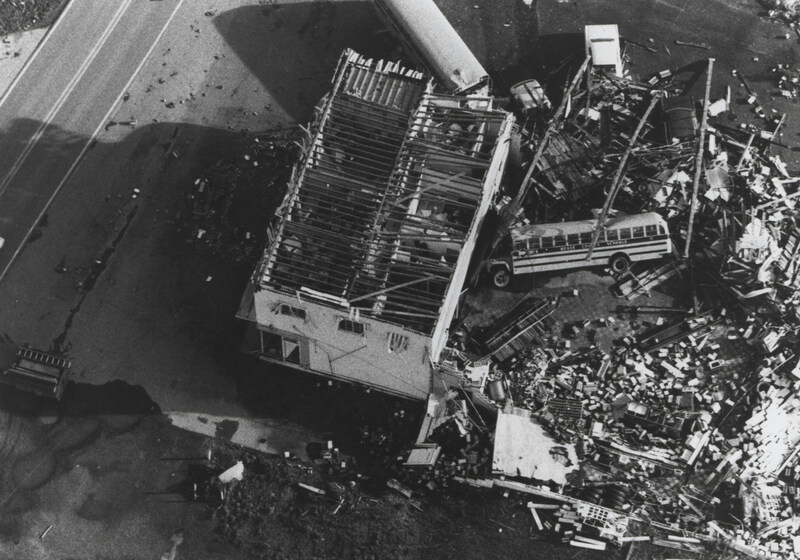 The 1974 super tornado outbreak took place in Georgia, Illinois, Indiana, Kentucky, Michigan, Mississippi, North Carolina, Ohio, South Carolina, Tennessee, Virginia, and West Virginia. 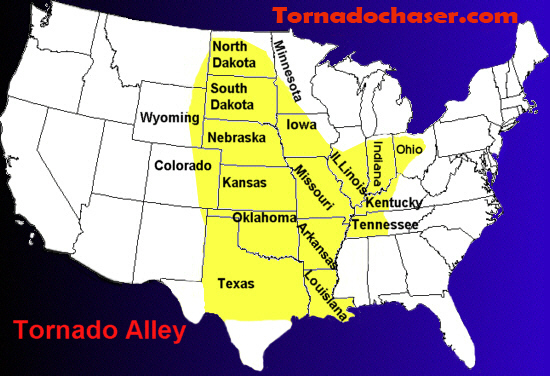 How many maps include these states in Tornado Alley? Not very many, some don’t include any of them; even I don’t include all of them. States such as Florida also have many small tornadoes but because the intensity of most of them is low, it is seldom considered as part of Tornado Alley by anyone. 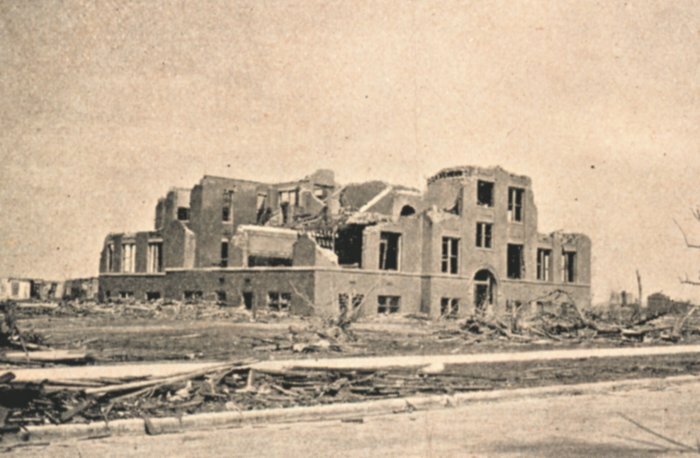 In 1925 the Tri-State tornado killed 695 people in Missouri, Illinois and Indiana, yet many don’t include these in Tornado Alley, I do. 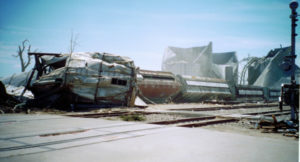 In November 2002 a tornado outbreak took place in Alabama, Tennessee and Ohio, Killing at least 36 people. 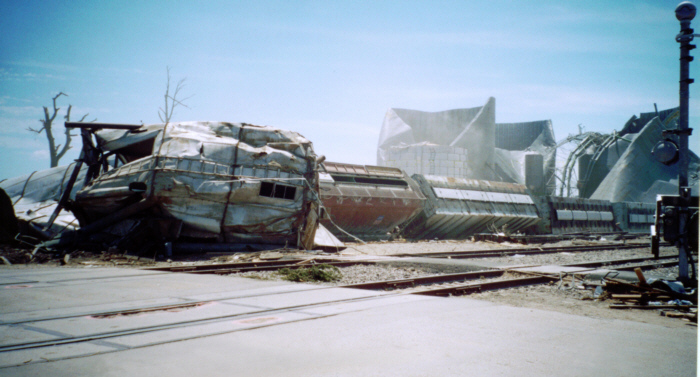 Friday, September 20th 2002 a tornado outbreak hit Indiana, I include these states in Tornado Alley, others don’t. History tells me Indiana, Ohio, Illinois, Kentucky and Tennessee are dangerous tornado states. 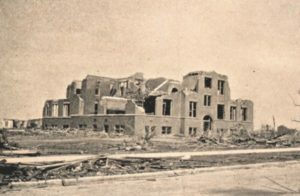 Continuing research helps shed light on the idea of multiple tornado alleys in the US rather than one general area. Reading the research paper “EVIDENCE OF SMALLER TORNADO ALLEYS ACROSS THE UNITED STATES BASED ON A LONG TRACK F3 TO F5 TORNADO CLIMATOLOGY STUDY FROM 1880 TO 2003” by Chris Broyles and Casey Crosbie of the Storm Prediction Center in Norman, Oklahoma; data has been analyzed to show a historical representation of several smaller apparent tornado alleys across the United States as determined by a long track F3 to F5 tornadoes. A map of the United States from 1880 to 2003 was constructed showing normalized frequencies of F3 to F5 tornadoes with path lengths of at least 25 miles. This research gives a well needed upgrade to how we look at tornado prone areas in the US and I believe helps give a more accurate representation of areas not always known as tornado alley. I continue to believe most tornado alley maps do not represent the most dangerous areas in the US correctly, and have been vague in defining them to the public which may become a serious safety issue in the future. I continue to believe we need maps showing multiple tornado alleys in the US and not ignore overwhelming evidence that many of the most violent tornado areas in the US have been left off traditional tornado alley maps for too long. 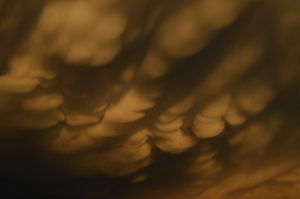 While it may be true that tornado frequency may be highest in a small area in the US on a yearly basis, dangerous and violent tornadoes happen over many tornado alley sections within the US that may have prolonged droughts of tornadoes before being annihilated by large, long lived tornadoes again and again. These small tornado alleys are seen when looking at the US by a county to county assessment. Below are the most dangerous counties in the US for F3 to F5 tornadoes with path lengths longer than 25 miles. Most of these dangerous counties are not listed on most tornado alley maps. Maps based on this county by county look is far more accurate than today’s maps. (To find the number of long path F3 to F5 tornadoes affecting a county from 1880 to 2003, multiply the frequency by the square miles and divide by 1,000). Below are the top nine areas for tornadoes. Notice the two counties listed above from Nebraska. These two counties border each other in southeast Nebraska. Fillmore and Thayer Counties, had the highest frequencies in the Great Plains with 15.63 and 13.91 long path F3 to F5 tornadoes per 1,000 square miles, respectively. Nine long path F3 to F5 tornadoes affected Fillmore County and eight affected Thayer County during the 124 year period. In the great plains Nebraska comes above any listing for Kansas, Texas or Oklahoma which none of those 3 made the top 9 list. Tornado F4 Hallam Nebraska 2 1/2 miles wide In 2004 Lancaster county in Southeast Nebraska had a long lived tornado that had a peak width of around 2 1/2 miles wide destroying the city of Hallam Nebraska proving the area to be one of the most dangerous in the US. The tornado event started 2 miles north of Daykin Nebraska, which is less than 5 miles from both Fillmore and Thayer Counties. In summary. f-scale rating was a maximim of f4 with a maximum path length of 52 miles. Most people would not be surprised to find that Oklahoma has one of the most dangerous cities in the US using this data, but look at the list of other cities toping the list. Below are the top 9 Cities for Long Track F3 to F5 Tornadoes in the United States from 1880 to 2003. The frequency of long track F3 to F5 tornadoes per 1,000 square miles is given for each city as a value. The higher the value the more dangerous. Thanks again to the following research paper as much of this information came from it. Credit to:“EVIDENCE OF SMALLER TORNADO ALLEYS ACROSS THE UNITED STATES BASED ON A LONG TRACK F3 TO F5 TORNADO CLIMATOLOGY STUDY FROM 1880 TO 2003” by Chris Broyles and Casey Crosbie of the Storm Prediction Center in Norman, Oklahoma. NOTE:Many of the opinions in this article are the ideas and opinions of Tornado Tim.